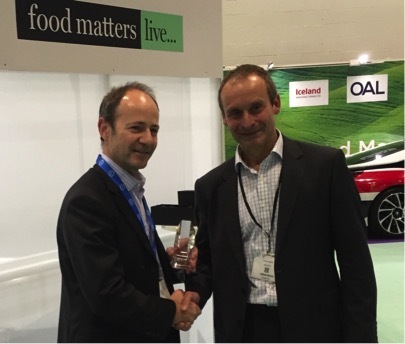 17 November 2015, ExCel, London, UK: Phynova was Highly Commended for its innovative natural functional food ingredient called ‘Reducose’ at the 4th Food & FMCG Innovation Pitching Event held at the Food Matters Live Conference in London. The competition, judged by a group of senior executives from major food and FMCG firms, such as Mars, Unilever, General Mills, Tate & Lyle, Tesco and Crown Packaging, had 18 short-listed participants each with ground-breaking food products and services. Reducose™ is a patented functional ingredient, derived from active compounds found in the mulberry leaf, that transforms foods and drinks with high levels of sugar or high levels of refined carbohydrates into ‘better-for-you’ products. Effectively it lowers the glycaemic index of foods and reduces blood glucose – without affecting the taste of the product, and without manufacturers having to reformulate. While it is important that we reduce the consumption of sugar and refined carbohydrates, Reducose has the potential to help solve a number of the big consumer issues around sugar and refined carbohydrates. Food Matters Live is the UK’s first cross-sector event bringing together professionals from across the food and drink industry, nutrition and health to address one of the most important challenges of our time: the relationship between food, health, nutrition and their connections with the environment, population health and wellbeing.